John Edwards' long, embarrassing saga into the criminal justice system is over. The Justice Department announced it won't seek to retry him and has moved to dismiss the charges. “Last month, the government put forward its best case against Mr. Edwards, and I am proud of the skilled and professional way in which our prosecutors.... conducted this trial,” he said. Driving home from work, all I had for information on the reaction to the John Edwards' verdict was Sirius. Against my better judgment, I put up with the incessant commercials for debt and income tax relief. I was sorry I did. On MSNBC, I thought the comments of Chris Matthews and his guests, including the authors of the Game Change, on John Edwards' post-verdict press statement, were appalling. Matthews and his panel all agreed John Edwards was a delusional egomaniac with no particular political or social insight beneath the surface. One criticized his reading ability. One even called him a psychopath. 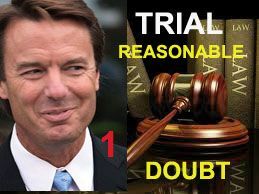 Why did the jury unanimously agree John Edwards was not guilty on Count 3 charging illegal campaign contributions from Bunny Mellon in 2008, while it was hung on the other counts?. Bunny Mellons' December, 2007 and January, 2008 payments were not deposited until after John Edwards withdrew from the Presidential race. Without those two checks, Bunny Mellon's contributions for the year did not exceed $25,000. While I do not believe I did anything illegal, or ever thought I was doing anything illegal, I did an awful, awful lot that was wrong and there is no one else responsible for my sins," Edwards said on the courthouse steps. "I don't think God's through with me. I really believe he thinks there's still some good things I can do and whatever happens with this legal stuff going forward, what I'm hopeful about is all those kids that I've seen, you know in the poorest parts of this country and some of the poorest parts in the world that I can help them," he said. Update: No verdict today and the jury may still be discussing the Bunny Money. 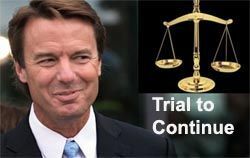 The jury will resume deliberations in the John Edwards trial today. MSNBC has graciously provided the full transcripts of closing arguments. The Judge's final jury instructions are here. Attorney and trial watcher for MSNBC Hampton Dellinger explains the possible outcomes here. Update: No verdict today, the jurors asked for some exhibits and a board to write and markers. Their requests pertained to the Bunny Mellon contributions. Update: Here are the final instructions given to the jury in the John Edwards trial. 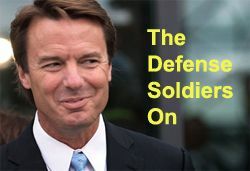 I really want to write something positive today, to give Team Edwards support and let them know that, outside of North Carolina, there are people like me and TalkLeft readers who think John Edwards has gotten the short end of the stick in this trial. 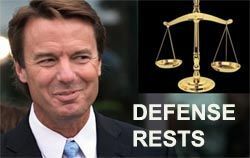 By now it's hardly a surprise, just a major disappointment, that the Judge in John Edwards' trial continues to restrict his defense and rule against his legal arguments, while giving the Government everything it wants. The latest: The Judge is going with the Government's position on the meaning of "the" in the statute that prevents candidates from accepting donations over $2,300.00 if they are "for the purpose of influencing the election." Although Eagles said she tried to balance the wishes of prosecutors and the defense in drafting her instructions, she delivered a clear victory for the government by saying she would tell the jury that money doesn't have to be for "the sole purpose" of influencing an election to be considered a campaign contribution. John Edwards concluded his defense today. Neither he, his daughter Cate nor Rielle Hunter testified. The Government apparently did not call rebuttal witnesses. Jury instructions will be argued this afternoon and closing arguments will be tomorrow. The jury will likely begin deliberating Friday. John Edwards was probably singing the Boomtown Rats, “I don’t like Mondays” to himself yesterday. His bad luck began in the morning when first the Judge got snippy with Abbe Lowell about Lowell deciding to put his expert witness on when she still hasn’t ruled on whether she’ll allow it. " Come back later in the and we’ll discuss it." Update #1: The FEC concluded an audit last month and found the funds from Baron and Mellon were not campaign contributions, but the Judge wouldn't let the witness testify to that. U.S. District Judge Catherine Eagles refused to allow Haggard to testify that the FEC determined last July that the money from the two donors wasn't campaign contributions. Prosecutor Jeffrey Tsai argued outside of the jury's presence that the stance of one FEC commissioner was irrelevant to the criminal case. Haggard was allowed to testify that FEC auditors never asked her to amend campaign finance reports to include the money from Mellon and Baron, even after Edwards was indicted last summer. The audit of the campaign, which was required because Edwards accepted federal campaign matching funds, was finally completed last month, she said. 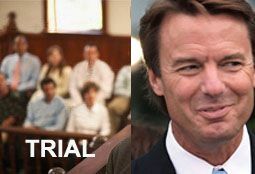 NBC's Today Show has a new video on whether John Edwards should testify at trial. 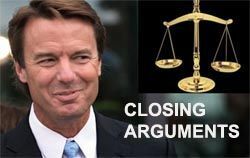 It includes interviews with two legal analysts who opine that John Edwards should testify. One even said "It's up to John Edwards to look the jury in the eye and convince them he did not violate the campaign finance laws." That's absolutely not the law. That the analyst obviously knows this is not the law and may just be making the point that in his view, as a practical matter, jurors will expect Edwards to convince them of his innocence, does not excuse his perpetuating such a false notion. It's really an irresponsible comment. 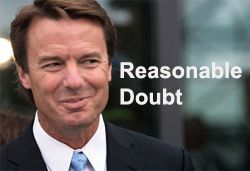 John Edwards does not have to convince this jury of a single thing. He has zero burden of proof. The burden of proof is completely on the Government. It is the Government that bears the burden of proving each and every element of each crime charged beyond a reasonable doubt. Lora Haggard: One of his campaign's finance officers from Georgia and Treasurer for the Center for Promise and Opportunity Foundation (to which Bunny Mellon contributed millions before even met Rielle Hunter). The Judge in the John Edwards trial heard two hours of argument today on the defense motion for judgment of acquittal and denied the motion. She ruled there was enough evidence to let the case be decided by the jury. She did express reservations about whether the Government had proved venue in Middle District of North Carolina. If the defense chooses to present witnesses, it will do so beginning Monday. 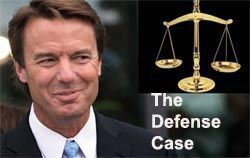 As I wrote last night, the Government is now seeking a jury instruction on "Sympathy" which leads me to believe it is concerned the defense will present at least one witness whose testimony might evoke sympathy for John Edwards. I can't think of anyone other than Cate Edwards who might fit in that category. "I have never asked anybody to pay a dime of money. Never been told that any money has been paid. Nothing has been done at my request."